Sesame oil has never really been on my radar as a beauty oil (I've only used it to make stir fry) but it turns out this stuff is an incredible beauty elixir. It's full of zinc--essential for producing collagen, as well as repairing damaged skin from acne--vitamins E, B complex, and D, as well as calcium, phosphorus, and protein for strong, healthy hair. To really reap all the benefits of sesame oil, make sure it's organic cold pressed. 1. Make a detoxifying oil cleanser by mixing 1/4 cup each sesame oil and apple cider vinegar with 2 tablespoons water; apply to damp skin, then wash off with warm water and your usual skin cleanser. 2. Apply sesame oil to skin right after you shower to help lock in moisture. 3. Use as a hot oil treatment for hair; it'll stimulate blood circulation to promote growth, and the fatty essential oils will nourish your strands. 4. Heal dry, cracked heels (essential now that the weather has cooled off); rub it into heels at night and cover with cotton socks that you don't mind getting stained. 5. To help prevent hair loss, make a pre-shampoo treatment by mixing 2 tablespoons of sesame oil with 2 egg yolks and the juice of a lemon, apply to damp hair and massage into scalp and down to the ends, wrap hair in a towel or shower cap, and rinse after 30 minutes. 6. Mix 1/4 cup brown sugar with 4 teaspoons of sesame oil and about 30 drops of eucalyptus essential oil to make a refreshing body scrub. 7. 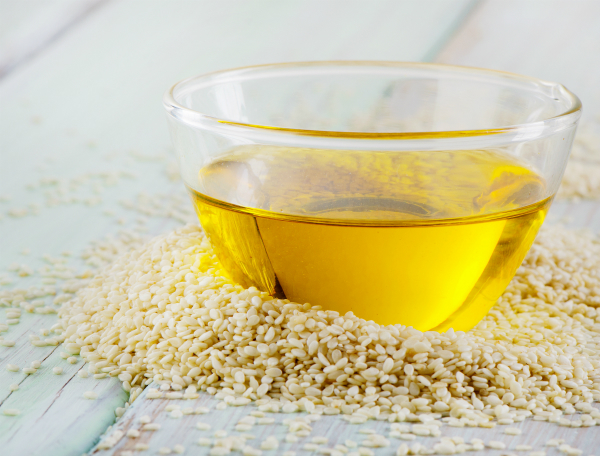 Add 2 or 3 tablespoons of sesame oil to your bath to draw out oil soluble toxins from your skin. 8. Rub a small drop between your palms and apply to dry hair to combat frizz. 9. Sesame oil is a natural sunscreen; apply to face and body to protect skin against harmful UV rays. 10. Wet face and massage oil into skin, then apply about a teaspoon of rice powder (find this at Asian markets) and gently exfoliate. Rinse with warm water.